Denise Smith was born in Minnesota, moved to Oregon where she lived until she graduated from High School, then continued her education in Chicago before settling in Missouri. Her first real involvement with the arts community came when she won a national “black-light poster” design contest in 1969. Since then she has experimented with a variety of 2 dimensional and 3 dimensional arts in a variety of styles and mediums. After an extensive career as a graphic designer and art director with a number of large national companies representing products in the juvenile products industry, aeronautics industry, and medical equipment industry, she went on to run her own graphics business, OptiMax Design (established 1995). Her business specializes in logo design, catalog and print material creation, giclee art printing and web site design. Her company is credited with taking a burden department with a major aviation company and marketing it to outside companies which created a profit center for the company earning over a million dollars in profit. In 2003, her business contracted to write the business plan and implement it in the creation of an art center to support the arts in Missouri, High Plains Art & Design Center. In 1-1/2 years it grew to include over 100 individual artists and 4 organizations exhibiting and selling artwork. During this time, Denise licensed over 70 works of art for reproduction and took the artists to several area shopping malls to introduce them to the public. In December of 2004, the owner of the building (the contractor) decided that he did not want to run a retail center and only wanted to be a landlord. The business plan, licensed artwork and net site has been transferred to OptiMax Design and the gallery is in the process of being transitioned into a virtual gallery where artists can sell their works or just come to be inspired by the wonderful talent of the artists who have continued to exhibit with High Plains Virtual Gallery. Denise loves to paint water, especially the ocean. Growing up in Oregon, she studied the physiology of ocean waves through a program offered by Portland State University. The stormy coast in that region offered a wonderful subject form. She works in oil, watercolor, pastels and pencil. She likes to mix the watercolor, pastels and pencil in layered multimedia works and believes one should never stop experimenting. Many of her works available in print are the results of these experiments. Her passion for jewelry design began in 1969 while in High School with a class at the local college on lost wax casting. 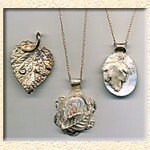 Recently she has been working to combine Precious Metals Clay (a new medium, .999 fine silver in clay), precious metal wire sculpting and millefiore caning techniques applied to clays. She is now beginning to experiment with creating dichroic glass cabachons to include in her creations. 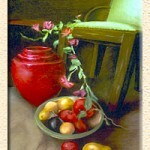 Her work is available at several local gift shops as well as online at the High Plains Virtual Gallery. For more information about Denise Smith and OptiMax design, please visit online: www.optimaxdesign.com. There is a button for “Fine art and Jewelry by D.C. Smith” that will take you to her personal section of the site. There is also a resource center section with valuable information for artists and links to artists and organizations.